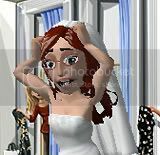 GMA mentioned today about how the economy has gotten brides looking to save a penny. I thought i'd pass it on! Weddings are infamously expensive. From the rehearsal dinner to the ceremony and reception, the average wedding now runs around $28,000. That price tag can put a damper on a fairy-tale time. But for newlyweds Natalie and Gene Taylor, saving a ton of money on their wedding -- $16,000 worth -- did not mean giving up their dream day.Like so many other young couples, the Taylors did not have a fortune to spend on their wedding so extravagance was out and creativity was in for their 200 guests. Here are some tips that "Good Morning America" received from the Taylors and from other viewers. Get married in the fall or winter. Summer weddings are the most popular. By getting married off season, the venue cost may be cut in half. Order invitations online. The Taylors saved around $1,200 by ordering their wedding invitations online and picking out the perfect style for their price. Look for discounted wedding dresses. Just because wedding dresses can be inexpensive does not mean they sacrifice quality. Natalie found her $1,100 dream dress for $100. According to Jamie Zanzinger of Real Simple Weddings, off-the-rack dresses from places like Anne Taylor, J. Crew and Target are the way to go. "What they're doing is picking these really high-quality fabrics and then not embellishing them so you can go and buy your own crystal beading or gorgeous lace and have a seamstress make it into an overlay for you," Zanzinger said. "You can make it your own. Make it look like a really high-end designer dress." Ditch the florist. For the Taylors' ceremony, a florist was charging $2,500. Wal-Mart did the job for $570. Find a friend or family chef. Rather than outsourcing to a caterer that could cost thousands, try to find a friend or family member who cooks. Natalie's mother and sister fed the 200 guests for $1,000. Pictures should be priceless, literally. Rather than hiring a pricey photographer, save around $2,000 by having a friend take wedding pictures. Decorate with borrowed style. Ask family members to help decorate with borrowed Christmas lights, tablecloths, tables and serving dishes instead of paying a professional decorator thousands. Eat a fake cake (not really). Buying a cake that is all fake except for the bottom layer allows the cake cutting celebration without the full cost of an elaborate wedding cake. I dunno if I agree with all of those. First of all a lot more women seem to be getting married in the fall. The only real down season anymore seems to be the dead of winter. I'd rather spend money on a photographer that knows what they're doing than wind up with no pictures. And I've seen where fake cakes can cost almost as much as a real cake and you still have to buy sheet cake to go with it. Personally, i've done the calculations on how to cut costs, and the only way for me (PERSONALLY) was to use an outside caterer or cut my guest list. I couldn't cut the guest list, so i am going the route of finding my own caterer and a venue that allows that. Some of the tips can work, but like Blablover5 mentioned - other times it may not, so you really have to do your homework before deciding what is right for you! This is helpful. One of my friends in SoCal is also getting ready for her January wedding. I'll pass this on to her. I'm new and like your blog. Yeah, another tip about the dresses is a bit off as well... some of those J Crew dresses are not that cheap! And then to buy the material and have a seamstress sew something to adorn it?? You could save a lot more money by buying either a sample dress, buying a bridesmaid dress in ivory/white, or buying a oncewed dress. And what about the idea of several different cakes on alternating cake stands?? That's a lovely idea, very trendy right now, and very affordable! Another cost-saving tip?? I-pod your wedding. You can pre-set a playlist and just set it to play all night. I'm definitely planning on using some of these tips, including the fake cake! I totally agree with Rachel on using an I-pod for the music. The playlist is the one thing the FH is in charge of! We are also taking full advantage of our talented relatives. My aunt and uncle are making our cakes, and the future FIL is going to play some piano for us.